I recently had a request for a scrapbook lesson. I love scrapbooking but don’t have enough time to do my own things.. So I used this opportunity to make a page using my daughter’s Sr. pictures from last year. The request was for a vintage scrapbook page. So this is what I designed: I love this page and the way it came out. So to start a vintage page, I looked at the current Stampin’ Up! designer papers and realized that we have several patterns that have a vintage feel to them! This is the Etcetera Designer Paper on a piece of 12×12 Very Vanilla card stock. I used the Very Vintage wheel on the vanilla background with pear pizazz ink to give the vintage look to the vanilla background paper. I selected 3 of the patterns from this designer package. One of the things that I love about Stampin’ Up! paper is that all the colors coordinate with the cardstock colors. So no searching for matching pieces. 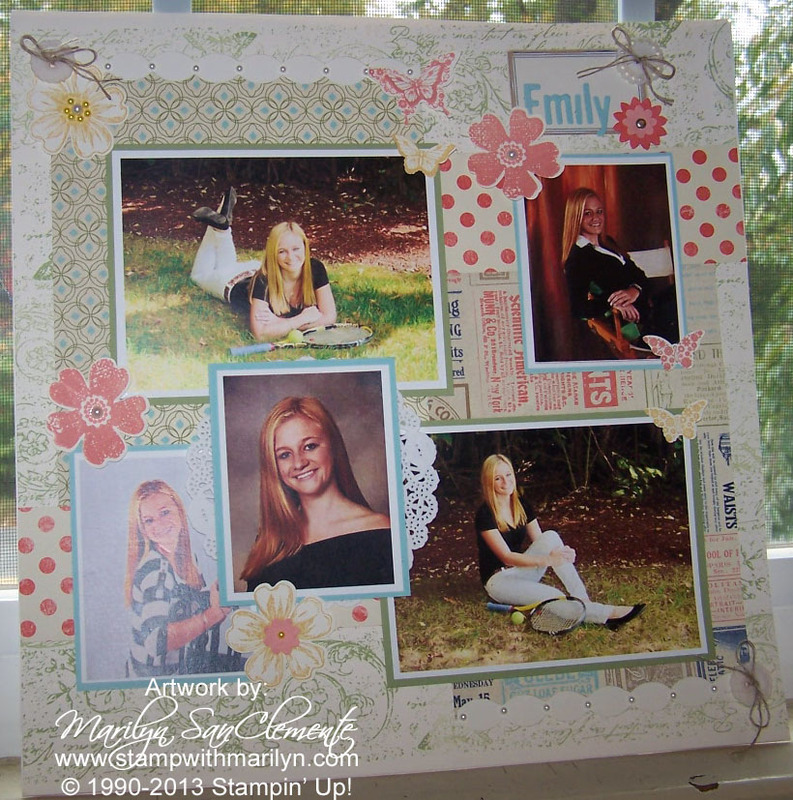 I used Pear Pizazz cardstock and Pool Party to mat my pictures. These are two of the colors that are in the Etcetera designer paper. I stamped the flowers with the Flower Shop stamp set and punched them out with the coordinating Pansy punch. I used the Papillion Potpourri stamp set with the coordinating punch to make the butterflies. The center of the flowers are embellished with the pearl jewels. The buttons are the Very Vintage buttons with linen thread through the holes. The decorative trim along the top and bottom were cut using the Tasteful Trim Big Shot die. Pearl jewels were added to each of these strips for embellishment. What is your favorite thing on this scrapbook page? Stamp with Marilyn, Stampin' Up!, Vintage scrapbook pages. Bookmark.